Nicolle always knew she wanted to do something in the healthcare field; helping to heal people, submersing herself in the clinical sciences and sharing her knowledge with others. Becoming a registered massage therapist gave her exactly that and more. It gave her a whole new outlook on how we see our bodies as an integrated system and how the simple holistic approach of just using our hands can help heal the daily stresses it takes on in our modern lifestyles. Massage therapy has numerous benefits, whether it’s rehabilitation for an injury or maintenance to prevent future injury. She also believes education and awareness on the benefits of home care exercises are just as important on the path to recovery. Nicolle is a graduate from the 3000 hour program at West Coast College of Massage Therapy in New Westminster. From her time at WCCMT she has earned clinical experience from the G. F. Strong Rehabilitation Centre, the Burns Plastics and Trauma Unit at Vancouver General Hospital, the B.C. Ride to Conquer Cancer and the Multiple Sclerosis In-reach Clinic at West Coast College of Massage Therapy. 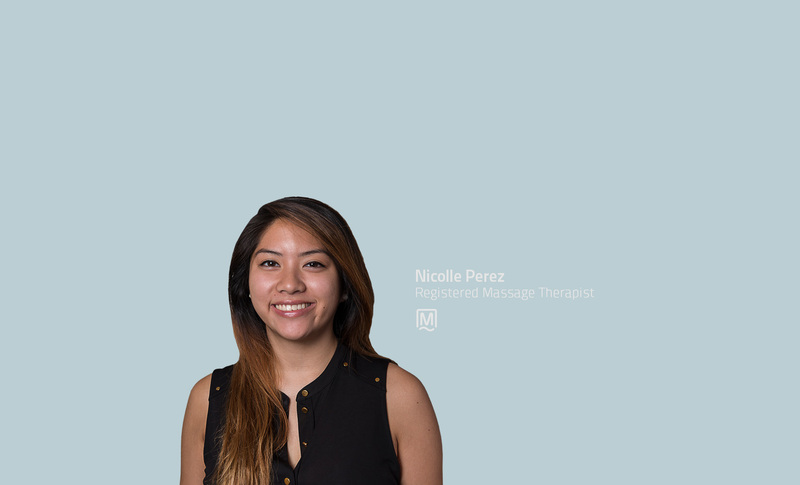 As a Registered Massage Therapist Nicolle strives to help patients reach their goals and return to a pain free lifestyle by creating individualized treatment plans, and educating patients in proper self care by providing easy home care techniques, especially for those with a busy lifestyle. Her practice focuses on postural awareness, pain management and stress management. Nicolle’s treatments consist of a moderate to deep pressure swedish massage combined with various techniques such as myofascial release, trigger point release, joint mobilizations, muscle energy techniques, manual lymph drainage, and active and passive stretching, catered to each individual’s needs, concerns or preferences. When Nicolle is not in the clinic, she spends her spare time hiking, reading, traveling, watching movies, going to concerts and spending time with friends and family.